As young as three years old through their first grade year (Summer Camp until third grade). Our program remains unmatched. We maintain excellence in reading, math, science, and technology. Our sports and fine arts programs provide experiences in swimming, music, art, dance, gymnastics and sports skills. At Acarath swimming is a valuable component of each child's day. Every student has a daily half-hour swim lesson in our 90 degree pool. New students work slowly and more individually until they become proficient. As they progress, more group activities are introduced. Stop in for a visit. We have an "Open Door Policy" so you are welcome to drop in anytime between 8:30am and 5:30pm for a tour. If you have a flexible schedule and are able to come anytime, the best times are between 9:30am and 11:30am. Feel free to contact us if you would like additional information. We are Schaumburg’s premier Montessori and childcare center! Since 1987, we have been educating children to become successful adults. In addition to Montessori, our program also includes daily swim lessons, and weekly classes in art, music, dance, gymnastics, and sports skills. Our staff to student ratio averages 6:1 and we have an industry low staff turnover rate. Please feel free to visit us. We have an “Open Door Policy”, so you are welcome to stop in without and appointment. Office hours are from 8:30 – 5:30. We are located in Schaumburg near Hoffman Estates off Roselle Road just south of the I-90 tollway . You will not find another school with as low a teacher to student ratio. Our students are given individual attention and because of that, they excel academically, emotionally and physically. Our kindergarten program consistently produces students who score in the 90th percentile and above on standardized tests. Most of our preschoolers are fluently reading and understanding basic math concepts BEFORE they enter their kindergarten year. We also provide meal options to accommodate vegetarian diet restrictions. Click here for our AM Montessori schedule. 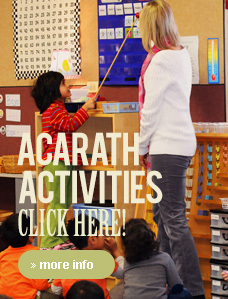 Click here for our PM Montessori Schedule. Here is a list of activities we offer. Click here for PDF copy of our Lunch Menu!